As part of its fight against hereditary defects in dogs and the suffering they cause the Kennel Club has introduced the Accredited Breeder Scheme with the aim of promoting good breeding practice and the production of healthy puppies. While it is not compulsory, any reputable breeder would be keen to be part of the scheme and to have their breeding stock accredited. All dogs that you use in breeding must be registered with the Kennel Club. You must follow the Kennel Club’s policies regarding maximum breeding age and the number and/or frequency of litters. You must permanently identify your breeding stock by tattoo, microchip or DNA profile. You must perform the health screening tests that are relevant to your breed on all your breeding stock. These health screening schemes include hip and elbow dysplasia, inherited eye conditions and DNA testing. (Note: there is no single hear-testing scheme as there is for other conditions such as hip dysplasia but breeds with heart problems will usually have their own club-organised schemes). You must draw up a contract of sale for each puppy. You must hand over a sold puppy’s or dog’s registration certificate at the time of sale if available or forward it to the new owner as soon as possible. You must socialise the puppies while they are still with you. You must provide the new owners with a written record of the immunisation measures taken so far. You should provide a reasonable after-sales telephone service. You must inform your buyers of the requirements and recommendations within the Kennel Club Accredited Breeders Scheme and inform them of the existence of the complaints procedure. 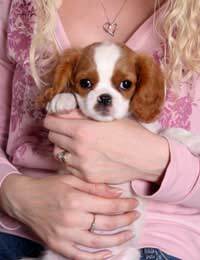 Make sure that their whelping facilities are in accordance with good practice. Make sure their contract of sale clearly lays out the nature and details of any guarantees given (for example, if there is a time limit) as well as any provisions regarding the return of a puppy and a refurn or replacement given. Both breeder and buyer should sign and date the contract, after having discussed and agreed on these terms. Commit to the puppies for the entire of their lifetimes, including helping with re-homing if necessary. Breeders are advised to learn about any inherited genetic conditions which may affect their breed. This can be done through research in literature (books, journals, etc) as well as discussing the issues with the breeder of their own dogs, with relevant breed clubs, with the the Kennel Club Health & Information Department and with your veterinarian. Note: Do not confuse these DNA Screening Schemes with the “DNA Profiling Service” that the Kennel Club also offers, which is for individual dog identification and parentage analysis of litters.